"She was beautiful in face and form, and lovelier still in spirit; As a flower she grew, and as a fair beautiful young flower she died. Her life had been always in the sunshine; there had never come to her a single sorrow; and none ever knew her who did not love and revere her for the bright, sunny temper and her saintly unselfishness." The true love of President Theodore Roosevelt's life was taken from him long before he set his sights on the oval office, but it may have been this tragedy that ultimately propelled him to become one of America's most iconic leaders. 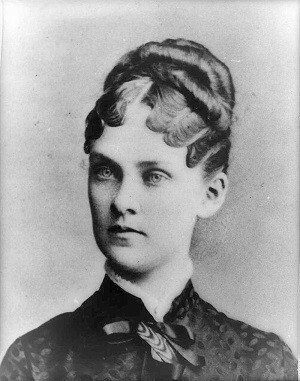 Theodore met Alice Hathaway Lee when he was a young man attending Harvard in 1878. Alice was a cousin of one of his classmates, and Roosevelt was instantly taken with her upon their first meeting: "As long as I live, I shall never forget how sweetly she looked, and how prettily she greeted me," he later wrote. As their relationship blossomed, Roosevelt proposed less than a year after meeting her, but she took a while to accept - eight months to be exact. Their engagement was announced 136 years ago this Valentines Day, in 1880. Sadly, just four years later on the exact same day, the couple would be parted forever. Theodore may have been the first nationally revered Roosevelt, but he was born into a family with significant influence locally in New York City. His father Theodore Roosevelt Sr. was a prominent businessman and a well-known participant in the glamorous social life of the old New York elite. 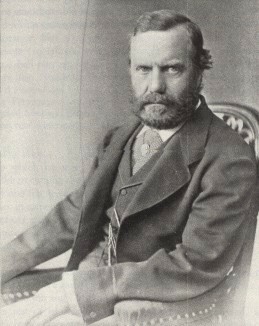 Theodore Roosevelt Sr. helped found the Metropolitan Museum of Art, the American Museum of Natural History and multiple children's hospitals in New York City. Alice was certainly fit to marry into such an elite family - she was tall, blond haired and blue eyed. She was also charming and friendly; those close to her affectionately nicknamed her "Sunshine". Theodore described his young wife as "fair, pure, and joyous as a maiden; loving, tender, and happy." 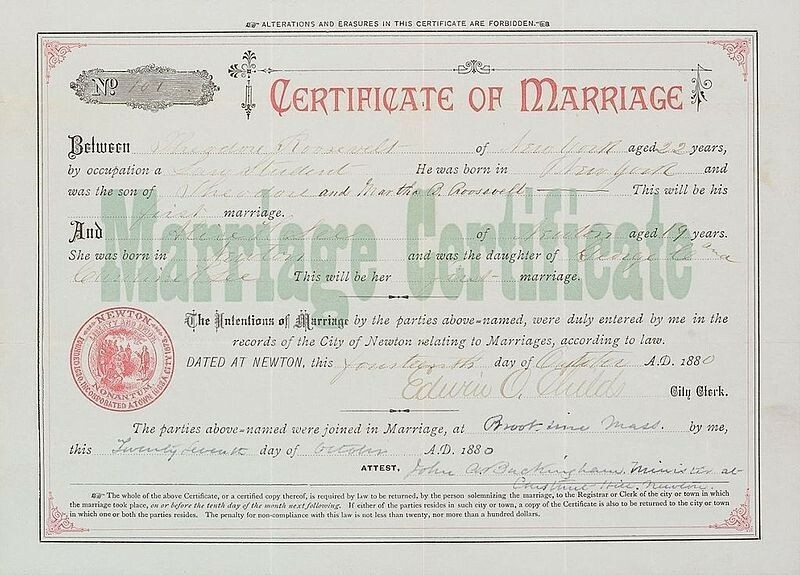 The original image has been cropped for better readability - the top row here displays the names, ages and places of residence of the couple, along with Theodore's occupation. The bottom row lists birth place, parents' names, the number marriage it was for each and the details of the officiant. The two spent the early years of their marriage actively participating in New York City social life and the couple toured Europe for five months in 1881. Shortly after, Theodore Roosevelt began serving in the New York State Assembly, where he began to make his political mark as a fierce opponent of corruption. 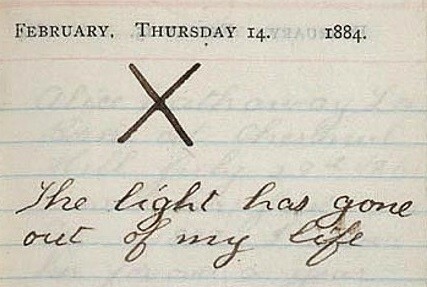 "The light has gone out of my life"
When Alice became pregnant in the summer of 1883, she moved back to New York City to be closer to her mother-in-law, Martha Bulloch Roosevelt. Theodore continued to work in Albany, and was convinced that the baby would arrive on the anniversary of their engagement announcement, Valentine's Day. Their daughter Alice Lee Roosevelt was born a few days short of Theodore's prediction - February 12th. Theodore was in Albany at the time but traveled home immediately, receiving word that his wife was in poor health during his journey. He arrived in New York to find the love of his life barely conscious and getting worse by the hour. It turned out she was suffering from an ailment called Bright's disease - the contemporary term for kidney failure. The condition had been masked by her pregnancy. She died on February 14th, four years to the day after the couple announced their engagement. Tragically, on the same day in the same house, Martha Bulloch Roosevelt, Theodore's mother, died of typhoid fever. This sequence of events absolutely devastated Roosevelt - he was truly never the same. He rarely spoke of Alice henceforth, and was too heartbroken to even care for his newborn daughter - he gave custody of her to his older sister Anna Roosevelt, and didn't reclaim care of his daughter until she was three years old. Shortly after the incident, he built a ranch in North Dakota and moved out west, learning the arts of the cowboy and earning the respect of westerners. 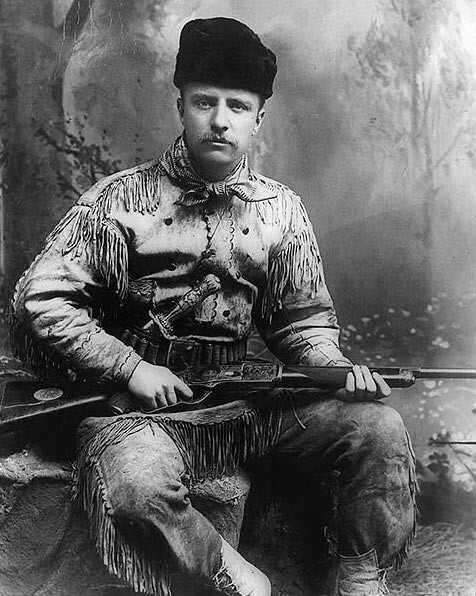 Just as he had overcome his chronic asthma as a child with rigorous activity, Roosevelt performed relentless physical labor in North Dakota to keep his mind off of his lost loves. While out west, he served as a deputy sheriff and helped western Americans with important issues. He helped ranchers better manage their land and began his first major conservation efforts, founding the Boone and Crockett club to save large animals and their habitats. Many believe that it was Roosevelt's time out west that turned him into a truly national political figure. He eventually returned east to New York City before gaining the national spotlight as Secretary of the Navy and leader of the Rough Riders. But ever since his time away from New York, he was well-known by mid-westerners due to his contributions while in North Dakota. His prowess as a rancher helped during the Spanish-American war and earning him respect from many outside of the elite circles of New York. Many believe that if Roosevelt's first marriage had not ended in tragedy, it is possible he wouldn't have become the man that we know him as today. On the day of their wedding - a small, private affair - London fog was so thick that it actually filled the church. Theodore coincidentally wore a pair of bright orange gloves, which incrased his visibility (historians debate the still-unknown reason for wearing the gloves). Though it is ultimately tragic, we can all draw inspiration from the story of his first marriage - in particular, how he was able to overcome the unthinkable and re-dedicate himself to public service. It reminds us that the experiences of our ancestors, whether happy or tragic, need to be told. Understanding the strife and struggle in your family history can be a source of inspiration for overcoming even the most difficult events.